Ooh, that smell! That is the reaction when someone gets wind of where a cat might have sprayed or inappropriately urinated. 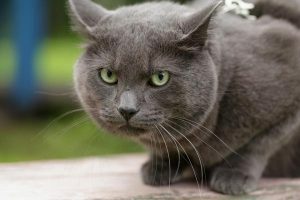 These episodes are really very common in cats and can infuriate the cat owners enough to lead to rehoming of their cats. Before you go down that path, let’s educate ourselves about why cats spray so that we can deal with the problem – or even better, prevent possible cat urinary problems. First we need to determine if it is behavioral or medical. Medical issues can cause inappropriate urination or marking and it is best to have them examined by a veterinarian to diagnose the problem. This would include Urinary Tract Infections, bladder stones and crystals, or possibly “idiopathic cystitis”. A medical diagnosis can be made by examining your cat, checking the cats’ bloodwork and doing a urinalysis on it. If there is something medical going on, antibiotics and maybe a diet change will be indicated. Undesirable Litter Box: Cats are particular about their toilets. The litter box may be simply too dirty, or it may be clean, but it may be too small. In multi-cat households, there may not be enough of them. The rule is to take the number of cats you have and add one litter box. The location of the litter box may be an issue. Finally, it might be the scent of the litter. Experts recommend that unscented, scoopable litter be used. Stress in the Home Environment: Scent is the primary way that cats communicate. They have scent glands on their cheeks, paws and flanks so when they rub objects, they are putting their scent on that object. This is sending the message that they’ve been there and are staking their claim to tell the other cats to back off. In multi-cat households, this rubbing helps to establish territories and create bonds between the pets. The cats may feel that it is too dangerous to access the litter box. They may also act out if there is a new human in the home. Cats are very sensitive to the smallest changes in the environment. Old Urine Smells: If your cat has urinated on an area and you clean it up, the smell might remain. A cat’s sense of smell is much better than yours. If old urine odors remain in your home, there is a very good chance that your cat is returning to the area because of the smell. She will continue to urinate in the area that smells like urine. Because of this, it is essential to thoroughly clean any areas where the cat has urinated using a special cleaner. In general, the key to stopping inappropriate urination in cats or avoiding it all together is as simple as being a responsible and attentive cat owner. Keep your cat healthy by visiting your veterinarian with routine health checkups. When issues arise, have the issue diagnosed and treated effectively and immediately. Make sure that the litter box is as attractive to your cat as possible, and clean up urine accidents thoroughly. Minimize stress in your cat’s environment. If you have any questions, please don’t hesitate to contact us call us here at the Olsen Veterinary Clinic at (618)-656-5868. Do all this, and your cat will thank you. Can You Spay Or Neuter an Older Pet? With the new year, it is always time to make resolutions. One of these may be to help control the pet overpopulation by having your pet spayed or neutered to prevent any unwanted pregnancies. If a client asks me what my opinion is, I would definitely recommend to spay or neuter your pet – even if the pet is older and reaching geriatric years in age. By neutering your male pet, you will be able to curb its behavior that has been influenced by the male hormones such as testosterone. Neutering may help lessen aggressiveness that is stimulated by the presence of female hormones. It will also help reduce and prevent prostate and testicular cancer that can be seen in older male pets that have not been neutered. Neutering may also help prevent spraying in male tomcats. I want to dispel any myth that neutering will make your pet lazy or cause obesity. When we spay female pets, we are performing what we call an ovariohysterectomy. This is the removal of the uterus and the ovaries. Females can carry even more serious risks if they are un-spayed, which is why you would want to spay even if they are older. Un-spayed females can develop a condition called a pyometra tha is essentially an infection of the uterus that continues to manifest itself. If left untreated, your pet will probably die as a result of the uterus rupturing and causing an abdominal infection, so these are treated as an emergency. Spaying is indicated at this time, however the surgery is a lot more complicated and complications can arise due to the toxicity that the infection is causing. Spaying will also help reduce the risk and incidence of mammary cancer in pets. This is based on the lack of female hormones that were produced from the ovaries that were removed during the surgery. Because of the hormones, female dogs and cats have their estrus cycles about every 6 to 8 months. During that time, their female organs can swell and create a discharge. These scents that are given off can attract males. So not only are you risking pregnancies but also complications that can follow. Pet owners tend to worry that their older pet may not handle the anesthesia or surgery well, but pre-surgical bloodwork can help reduce or alleviate the issue with the anesthesia and make it as safe as possible. Any time a patient undergoes a surgery, there is a risk, albeit a slight risk. The benefits from spaying or neutering clearly outweigh not doing so. If you have any questions, please feel free to contact us here at the Olsen Veterinary Clinic and we would be happy to answer any questions or dispel any myths that you may have heard. With the holidays rapidly approaching, pet owners usually ask for gift ideas for their four-legged companions. As with every other Santa’s list from our children, electronics and technology play an important part in holiday pet toys. So without further adieu, I will introduce some ideas that might be appealing to the pet owner with the pet in mind. Bascolor Electric Rotating Butterfly– This gift from Amazon is for the cat owners who want to keep their kitten active. It is described as a butterfly that flashes in the dark that will fulfill your kitty’s hunting urges. Cat Scratcher Lounge– This cardboard lounge is infused with catnip that your cat is going to be addicted to in record time. It also can be used as a scratch board. Available from Amazon for about $20. K&H Crinkle Sack Cat Bed– This cat bed makes the noise of a paper bag that your cat will love. Inside, it is covered with a plush lamb wool that is easy to wash and take care of. The overstuffed bolster keeps the sack open for easy access for your kitten. It is also available on Amazon. Nerf Tennis Ball Blaster– This toy will launch tennis balls 50 feet in the air and is easy to operate. It works with standard tennis balls but if you get the lighter replacement balls they will go farther. No need to touch the slimy ball because it is easy to reload. Pet Acoustics Pet Tunes Calming Music Dog Speaker– A bluetooth speaker that is preloaded with 90 minutes of music developed by a sound animal behaviorist to reduce stress and calm nervous canines. It alleviates stress and related behaviors such as excessive barking and pacing which can happen when your pet is home alone during thunderstorms, traveling or when it is adapting to new environments. It comes complete with a rechargeable battery. GPS tracking systems– There are many available for the high tech owner that can have a GPS and activity monitor which set up virtual fences to indicate safe zones and give notifications where your pet has traveled too far. They range in price starting at $39. 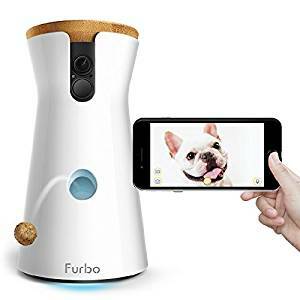 Furbo Dog Camera– For the really techie person that wants to see, talk and toss treats to your dog even when you are not at home. It gives smart dog alerts and the camera gives peace-of-mind to the dog’s parents. The camera lets you see, talk and toss treats from anywhere and sends alerts when your dog barks. The two-way camera allows you to hear and speak to your dog and works with Amazon Alexa. Pet DNA testing– By discovering your pet’s ancestry, pet owners and veterinarians can work together to tailor wellness plans that fit the unique one-of -a-kind needs of the dog. It helps owners discover typical ailments that certain dogs can have over one another and provide insight to personality traits of the breeds in your dog’s genetic make up. It is also available for cats. Price ranges from $70 to $180. This is not an all-inclusive list, but it may give pet owners ideas when shopping for our four-legged friends. At this time, I would like to thank each and all of my clients for their loyalty and business that have come my way. May each and everyone have a happy and safe holiday season and a prosperous 2018. Don’t forget to contact us at any time, even during holiday emergencies, if you have any questions. If the holidays are at your place like it is at our place, it is family, food and football—not necessarily in any order. Unfortunately many pet owners think that holiday time means giving their pets a taste of the tender morsels that they partake in. Before you give table scraps – STOP and think a minute. These high-fat type of foods or foods that your pet is not accustom to can lead to disaster if given to our pets. Just a small amount can lead to pancreatitis in our pets, which can lead to terrible consequences. If your pet develops pancreatitis, the treatment focuses on supportive care, such as controlling nausea and vomiting, preventing further dehydration or imbalances in the blood and feeding a low-fat nutritious diet. Serious cases may mean hospitalizing your pet for a few days or longer. Unfortunately, many other diseases have these clinical signs and it makes it a challenge determining if your pet has pancreatitis. Early diagnosis and treatment is the key to preventing other complications such as dehydration and other systemic diseases. As your pet ages, he can develop intolerances to certain foods so it may be best to just feed high quality pet foods with little variance and only allow healthy pet treats in moderation. Most owners know that a only a good quality diet is necessary for their pet, however sometimes good intention visiting guests can complicate things by letting them finish their plate or giving them all of the trimmings off the turkey because they couldn’t resist. This kind gesture could lead to the previous mentioned consequences. Holidays are all about celebrating and pets are a big part of our family. 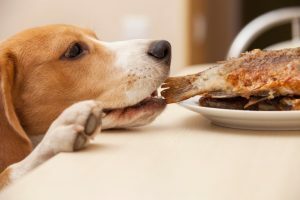 Kind gestures like feeding table scraps can put a damper on the celebrating if it involves an emergency trip to your veterinarian. So if you set ground rules and make your guests aware of the restrictions for your pets, we can have a safe and happy holiday season. 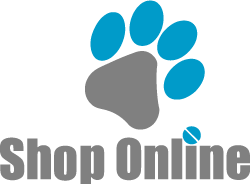 Olsen Veterinary Clinic is committed to the health and happiness of your pet. For questions, or to schedule an appointment, contact us here. Every once in a while I will spotlight a breed in my newsletters. I have done a couple of dog breeds, but this month I have decided to write one for our furry, feline friends. The breed is called the Savannah Cat. It is a cross between the wild African Serval Cat and a domestic breed—most commonly the Bengals, Egyptian Maus and Oriental Shorthairs. The actual first Savannah was born on April 7, 1986 from parents that were the Serval cat and a Siamese. The kitten’s name was ironically named Savannah. After several years of breeding and creating the new breed standard, the new breed was recognized in 2012 by the International Cat Association. Most Savannahs have a tall, lean build that gives them the appearance of greater size than their actual weight. This trait has given them the title as being the world’s tallest domestic cat breed in the Guinness Book of World Records since 2006. They are long legged, and if they were athletes, they would be heavily recruited by basketball teams! 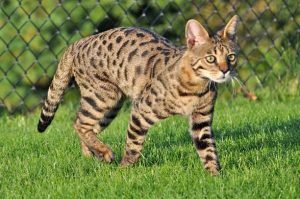 The Savannah’s can weigh between 8 to 20 pounds and come in many different colors and patterns, such as black, brown, or black spotted tabby; black silver spotted tabby; or black smoke. Most have solid black or dark brown spots on golden, cream, sandy or white backgrounds. They stand out for their bold, solid markings, which can be round, oval, or elongated. Other colors and patterns do exist and can be registered into the breed register but cannot be shown. Savannahs have a triangular head that is supported with a long neck and topped by large, wide ears. They have medium sized eyes that can be any color but are usually blue at birth. This breed takes about 3 years to reach maturity and their back legs are usually a little longer than their front. The Savannahs are NOT a sweet, quiet lap cat. However they are very active, confident and enjoy reacting with people and other cats. They are intelligent and curious and always looking for something interesting to do—the more adventurous the better. They have a knack for being quite mischievous and are not a good fit for owners that are away a lot or not active. So it may be best to have a companion for them. 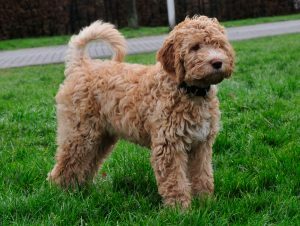 This breed is not cheap to own, due to the confirmation of the breed standard, their temperament, demand and scarcity. The F1 Savannah cats which are 50% – 82% or higher wild blood can sell for up to $22,000 because mating is very difficult. They have very small litters and very low fertility. The F1 offspring do not like to be held, but like to be petted, scratched and be in contact with humans. They tend to gravitate to one person and get along with other pets just fine. F1’s are also the largest of the breed, where they can weigh up to 30 pounds. As more domestic blood introduced, the Savannahs will be smaller, but can be more enjoyable members of the family as far as personality goes. So if you have a Savannah or even a domestic “four legged” furry feline friend, Olsen Veterinary would be happy to make sure that they remain healthy. Please call the office at 618-656-5868 if you have any concerns or would like to schedule an appointment. You can also go to our website and request an appointment. Our team would then be able to set that up. In today’s society, almost everyone has some medications – whether over-the-counter or prescription sitting around at home. The important thing to remember, however, is that human medications and pet medications are NOT created equal. While some human medications are safe, some can be very toxic to pets if they happen to ingest them. As a matter of fact, the Pet Poison Hotline reports that nearly 50% of the calls involve human medications. 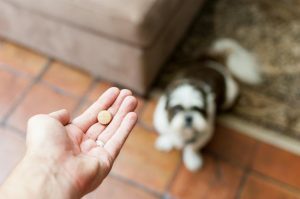 These issues can arise if your pet accidentally chewed into the pill bottle or a well-intentioned pet owner gave their pet a human medication. Pet poisonings are common, can be very serious, and spell disaster for a beloved pet. With that in mind, listed below are 10 medications that can cause toxicity to your pet and therefore should be kept away from them. NSAIDS – Non-Steroidal Anti-Inflammatory Drugs are common, everyday drugs that are found in most households. This classification includes popular drugs like Aleve, Advil and Motrin. The side effects can be some of the most dangerous drugs for pets to ingest. In fact just 1 or 2 pills can cause pets to suffer serious stomach and intestinal ulcers and in some cases cause kidney failure. Acetaminophin – For that occasional headache or fever, almost everyone has some Tylenol sitting around their home. As safe as it is for children the opposite is true for pets. Just a small dose of acetaminophin can cause damage to your pet’s red blood cells, reducing its ability to carry oxygen through the body. The drug can also cause liver damage in your pet. Birth Control Pills – Dogs usually mistaken the birth control containers for toys, but if they swallow a large number, they can get ill. Estrogen and Estradiol have shown to cause bone marrow suppression in pets. Surprisingly, female pets have an increased risk of suffering from the most serious side effects. Antidepressants – Veterinarians have at times prescribed medications meant for humans to pets like Prozac. When used as your veterinarian has prescribed, they are safe. But accidental or overdose can be toxic to your pet. These clinical signs can include serious neurological problems that include sedation, loss of coordination, tremors and even seizures. ADHD/ADD Medications – Prescription medications for this human condition are very strong stimulants like amphetamines and are very dangerous for pets. Ingestion of small amounts can cause life-threatening tremors, seizures, elevated body temperature and heart problems. Drugs in this category include Adderall, Ritalin and Concerta. Benzodiazepines and Sleep Aids – Drugs like Xanax and Ambien are given to humans to reduce anxiety and help sleep better. However in pets, it can cause the opposite. It has been shown that small doses can cause pets to be agitated, along with severe lethargy, incoordination, and a slowed breathing rate. In cats, it has been known to cause liver failure. Beta-blockers – Beta-blockers are commonly prescribed drugs for humans suffering from blood pressure problems. But all it takes is a small amount for pets to ingest to make it life-threatening to them. These drugs can cause severe drops in blood pressure and a very slow heart rate. Ace-Inhibitors – Like in humans, these drugs are often used in veterinary medicine to treat pets suffering from high blood pressure. Though typically safe, overdoses can cause low blood pressure, dizziness, and weakness. If pets have ingested just a small amount of this medication, they can be monitored at home unless they have kidney failure or heart disease. Cholesterol-Lowering Drugs – Drugs like Lipitor are advertised on the TV and are now found in many households in America. While these drugs are considered statins, long term use can potentially leads to problems. In most cases, one may see some mild form of intestinal upset which would include vomiting or diarrhea. Thyroid Hormones – These medications are routinely prescribed for pets that have underactive thyroids. Surprisingly the thyroid hormone needed to treat dogs is much higher than a persons dose. So, if dogs accidentally get into thyroid hormones, it rarely results in problems. In cats it can be a different story. Large overdoses in cats can cause muscle tremors, nervousness, panting, a rapid heart rate and aggression. Most pets are naturally curious creatures so it is important to keep them out of reach from your pets. Here are some tips to help ensure that they never ingest your medicine. Never leave loose pills in a plastic sandwich bag-the bags are too easy to chew into. Make sure the rest of the family does the same, keeping their medications out of reach. If your medication is in a pill box or weekly pill container, make sure that it is safely stored in a cabinet. Too many pets may think that it is a plastic toy. Never store your pets medication near your medications. Pet poisonous hotlines received several calls every year from concerned owners who have inadventantly given their own medication to their pet. Hang up your purse or backpack. Curious pets will explore the contents of your bag and simply placing it out of reach solves the problem. A lot of pet poisonings stem from pets ingesting human drugs and pets metabolize the drugs differently than humans do. So because of this, even safe over-the-counter medications may cause serious poisonings in pets. If your pet has ingested a human over-the-counter or prescription or medication, please call your veterinarian, your local emergency animal hospital or the Pet Poison Hot Line’s 24 hour animal control center at 800-213-6680 immediately. Of course, if our office can be of any assistance, do not hesitate to call or contact us here. With the dog days of summer upon us, we as pet owners need to be aware of heatstroke with your pet. This can be a life-threatening condition that occurs because your pet cannot lower its body temperature efficiently, so its body temperature increases to dangerous levels. There are many common situations that can set the stage for heatstroke. These include: strenuous exercise in hot, humid weather, being a brachycephalic (short-nosed) breed, suffering from heart or lung disease that interferes with efficient breathing, being confined without shade or shelter and fresh water in hot weather, being confined on concrete or asphalt and the most logical-left in a closed up car in the warm weather. Heatstroke begins with heavy panting and difficulty breathing. The tongue and mucous membranes appear bright red. 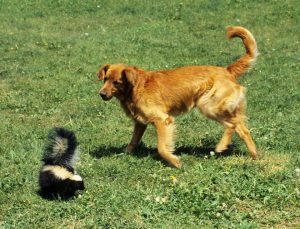 The saliva is thick and tenacious and the dog usually vomits. The rectal temperature rises to 104 to 110 degrees Fahrenheit. The dog becomes progressively unsteady and passes bloody diarrhea. As shock sits in, the lips and mucous membranes turn gray. Collapse, seizures, coma and death rapidly ensue. It is important to take emergency measures to begin cooling your pet immediately. One suggestion would be to move it to an air-conditioned building and begin cooling your pet with spraying your pet with a garden hose or immersing it in cool water for up to two minutes. Also if possible, it is helpful to place the wet pet in front of an electric fan. Ice packs work well when applied to the groin and armpit areas because this is the area where the blood is the closest to the surface in the body. Monitor the rectal temperature and continue the cooling process until it falls to 103 degrees. Seeking veterinary assistance is of utmost importance since this is an emergency. Your veterinarian will take steps to reverse the effects of heat, dehydration, and low blood pressure. An IV catheter will be placed and fluids will be given to help get blood flowing to major organs again. Treatment is aimed to supporting these organs in the hope that the damage that they have sustained isn’t permanent. Unfortunately, it will often take days to know which organs have been affected. Specific treatments may include antibiotics, blood pressure medications and blood transfusions. Because heatstroke can be so deadly and strike rapidly, it is best to take steps to prevent it. 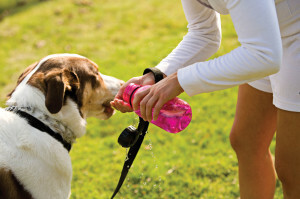 In hot weather, it is best to exercise your pet during the coolest part of the day (early morning and late evening) and always provide plenty of fresh, cool water and rest. A person can also help their pet by cooling them by allowing them to swim or spray them off with a hose after exercising. Never leave a pet in a car during warm weather-not even for a few minutes with the windows cracked. 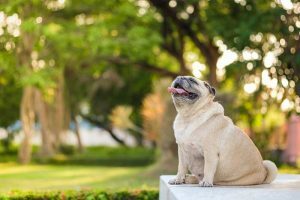 Brachycephalic dog owners should be extra vigilant, keeping their dogs inside in air-conditioning on hot days. All geriatric, obese, and respiratory compromised pets should be exercised with caution in hot weather. So remember if your pet is acting distressed, start cooling it down and seek assistance from your veterinarian immediately.